The following data set contains the average dividend yields for 15 utility stocks in the United States. The observations are names of the companies, and the variables correspond to the annual dividend yields for the period 1986–1990. The objective is to group similar stocks into clusters. 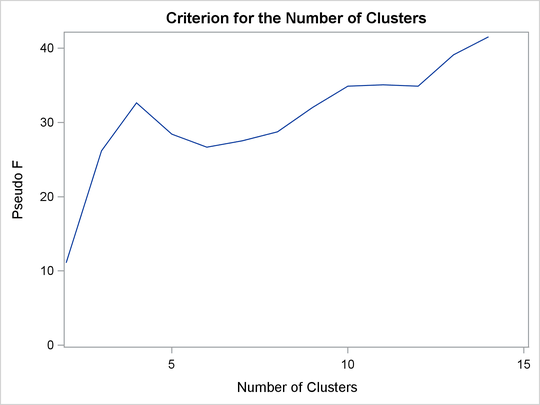 Before the cluster analysis is performed, the correlation similarity is chosen for measuring the closeness between each observation. Since distance type of measures are required by PROC CLUSTER, METHOD=DCORR is used in the PROC DISTANCE statement to transform the correlation measures to the distance measures. Notice that in Output 36.2.1, all the values in the distance matrix are between 0 and 2. 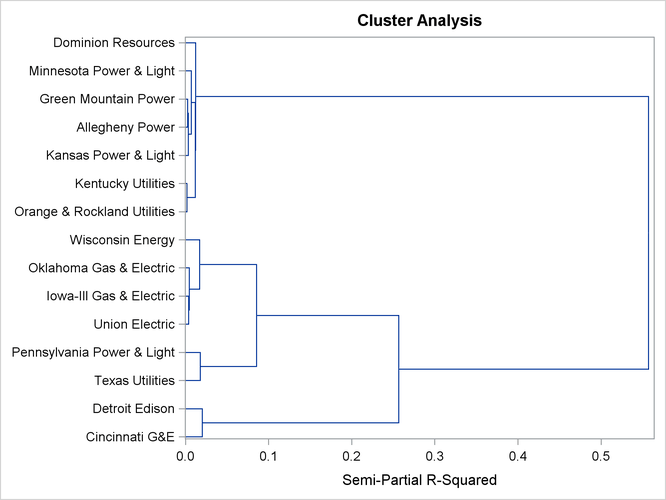 PROC CLUSTER performs hierarchical clustering by using agglomerative methods based on the distance data created from the previous PROC DISTANCE statement. 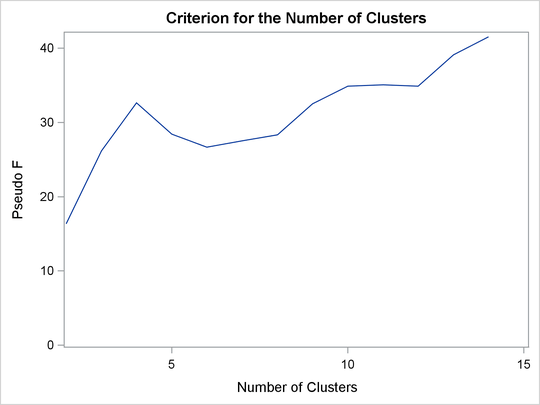 Since the cubic clustering criterion is not suitable for distance data, only the pseudo F statistic is requested to identify the number of clusters. 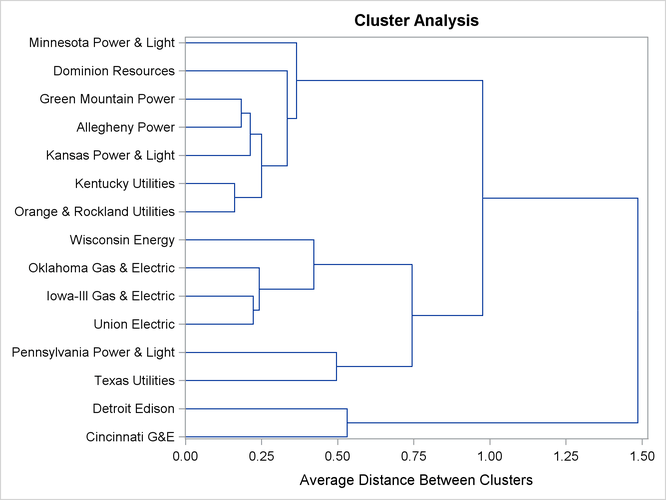 The two clustering methods are Ward’s and the average linkage methods. Since the results of the pseudo statistic from both Ward’s and the average linkage methods contain many missing values, only the plot of the pseudo F statistic versus the number of clusters is requested along with the dendrogram by specifying PLOTS(ONLY)=(PSF DENDROGRAM) in the PROC CLUSTER statement. 0.00000 . . . . . . . . . . . . . .
0.82056 0.00000 . . . . . . . . . . . . .
0.40511 0.65453 0.00000 . . . . . . . . . . . .
1.35380 0.88583 1.27306 0.00000 . . . . . . . . . . .
1.35581 0.92539 1.29382 0.12268 0.00000 . . . . . . . . . .
1.34227 0.94371 1.31696 0.19905 0.12874 0.00000 . . . . . . . . .
0.98516 0.29043 0.89048 0.68798 0.71824 0.72082 0.00000 . . . . . . . .
1.32945 0.96853 1.29016 0.33290 0.21510 0.24189 0.76587 0.00000 . . . . . . .
1.30492 0.81666 1.24565 0.17844 0.15759 0.17029 0.58452 0.27819 0.00000 . . . . . .
1.24069 0.74082 1.20432 0.32581 0.30462 0.27231 0.48372 0.35733 0.15615 0.00000 . . . . .
1.04924 0.43100 0.97616 0.61166 0.61760 0.61736 0.16923 0.63545 0.47900 0.36368 0.00000 . . . .
0.74931 0.37821 0.44256 1.03566 1.08878 1.12876 0.63285 1.14354 1.02358 0.99384 0.75596 0.00000 . . .
1.00604 0.30141 0.86200 0.68021 0.70259 0.73158 0.17122 0.72977 0.58391 0.50744 0.19673 0.60216 0.00000 . .
1.17988 0.54830 1.03081 0.45013 0.47184 0.53381 0.37405 0.51969 0.37522 0.36319 0.30259 0.76085 0.28070 0.00000 .